I'm new to CSS and mainly bought it because I had the hope it would solve a problem for me concerning specific device control. 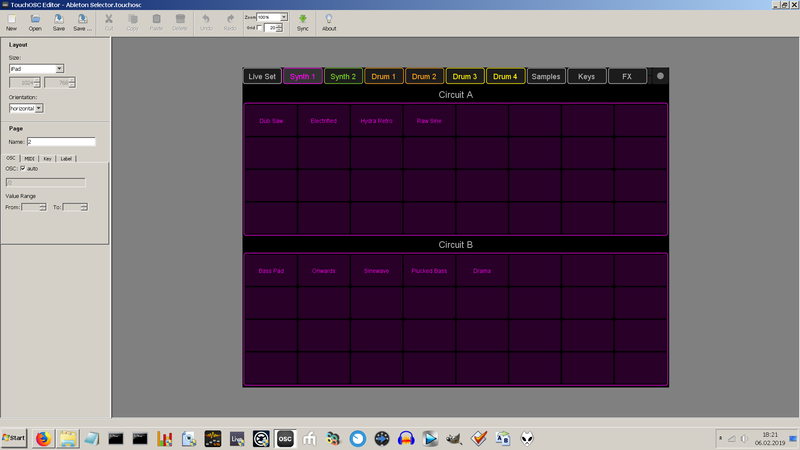 Right now, I'm trying to set up a control surface that allows me to control the eight macros of an selected instrument rack (via chain selector) within an instrument rack. Please see the exampled device chain attached to this post. I already made it to control all eight macros of all instrument racks within the instrument rack at the same time. Please see the screenshot of the script manager in CSS. However, as I'm using this method as a VST preset selector, I only want to change the macros of the currently selected instrument rack. What I thought could work, is to set up a 'mode' for every instrument rack in the chain selector which is then switched via a 'mode selector'. I tried this, but the only controls available for the mode selection are PGM (program change messages) which are not supported in CSS. Hope that somebody could help me out on this. Thanks in advance. So I was fooling around and I came up with a possible solution to your issue. Device 3 will be Chain Targeting: Device 2 Chian 3 (Dub Saw)... etc. Under each device that you created, you will insert a Select Device mapping ( for a total of 6 instances of Select Device, one inside each created device), and on that mapping, you will use the same knob for all six instances of Select Device (Knob 1, for example). Set each one of the six Device Select mappings to use the same knob, and for each instance, set the Control to Custom and Use the Control type as On/Off. For each successive chain, you will increment the values for On and Off... Chain 1: on 0 / OFF 27; Chain 2: On 28 / OFF 44; Chain 3 On 45 / OFF 77; etc. up to 127 to get all six chains on the one knob. It seemed to work on my test, but I didn't use an endless encoder, and this might not work with an endless encoder. The only other thing I think you would need to do is either map the same 'knob 1' to function as a chain selector on the Chain Select Ruler and separate the 6 different chains in the Zone Editor by the same values as you used to turn on and off the Device Select, and I think you got it. To do this, Just create a parameter bank for device 2... it will have the first 8 parameters for the Macros for that device 2 (not the macros for each individual instrument chain)... the 9th parameter "Select Parameter by Number '9' will control the position of the cursor on the Chain Select Ruler. Try Mapping Parameter 9 to Knob 1 as well. I haven't tried this but I bet it will work! That should give you the ability to choose your chain and have it so Live will only play the chain that you have selected. As you probably sorted out, once you have this, then just create another device and this one will not be chain targeted. For Device selector under the Device creation, choose "Selected" device, and build the 8 parameters that will function to control the selected chains 8 Macros. Never mind about that parameter 9. I tied it, and it is no longer behaving like I thought. Just map one of your macros for device 2 like you had and set up the Zone Editor the same as your instances of on and off and that should do the trick. Map the first macro of device 2 to the same knob as the ON/OFF knob. That might work. I'll try that as soon as I got home from work. Thank your for your thoughts Greg! Normally I'm controlling the device selector (sound selector) with TouchOSC on the iPad in order to select the respective preset. For example, TouchOSC controls the device selector for synth 1 with just one CC, in this case CC1/Ch. 14. It also controls the device selector for synth 2 accordingly with CC2/Ch. 14, and so on.. I've attached a screenshot on this. Is it possible that the 'select device' function is controlled by this rather than being controlled by knob 1? What if I set up a second control surface for that TouchOSC template that controls the device select and the 'select device' function? Would the controller still control just the selected device or are is this just working when it's also selecting the device? I'm not sure I 100% understand what you are trying to achieve, but one thing I noticed from your videos is that when you are switching devices, the selected device is only selected with the blue hand. For CSS, the selected device is the one that's highlighted. our Device Select Mappings should highlight devices where as maybe TouchOSC only changes the blue hand? You were right, TouchOSC only changes the focus of the blue hand but doesn't select the actual device. 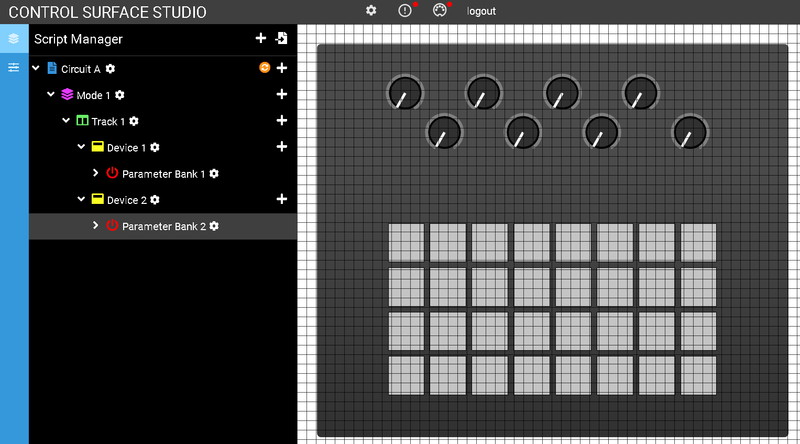 I made it to create a control surface for TouchOSC with CSS as well and added the 'select device' function. Now everything works nearly fine, this gives me a lot more control over the macro knobs of each instrument. How can I solve this in CSS?